Sleeping in the club? Usually that’s a good way to get kicked out. 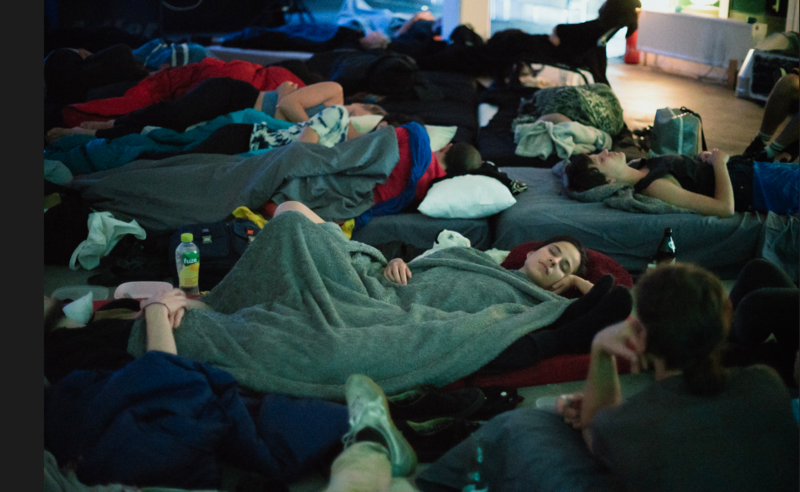 And yet there’s a new scene of events that encourages people to bring their sleeping bags and pillows for what looks a lot like an adult sleepover set to ambient drone music (see our previous article about Max Richter’s ‘Sleep’). I recently heard about this scene, and ever since I’ve been curious to know how one of these parties actually feels. Why would anyone go to a club to sleep when they could just as easily, and more comfortably, do it at home? And beyond that, why would anyone want to DJ for a crowd of sleeping people? Fortunately, a local crew called “Raum für Kunst” asked me to play at their latest party. Before I even got to the party, the promoters gave each of us artists some light reading in the form of a small manual called ‘Field Guide For Effective Sleepover Droning’. “This is actually a sleepover and actually a drone show,” it read. “The goal is a self-organized and intentional team of drone stars and vibe-creators who can lead the room to astral transcendence.” It quickly became apparent that there are many things that need to be taken into consideration when performing for a crowd of sleeping people: You have to think about the sounds that you play, so that they don’t disrupt anyone’s R.E.M. cycle—nobody wants their dreams interrupted by a sudden drop or annoyingly high-pitched note. I realized that I would need to create the subtlest, least-offensive set possible. Then I was at the party with the other artists. It was an unsurprisingly relaxed and muted affair, but with surprisingly loud music, considering that everyone was supposed to sleep. 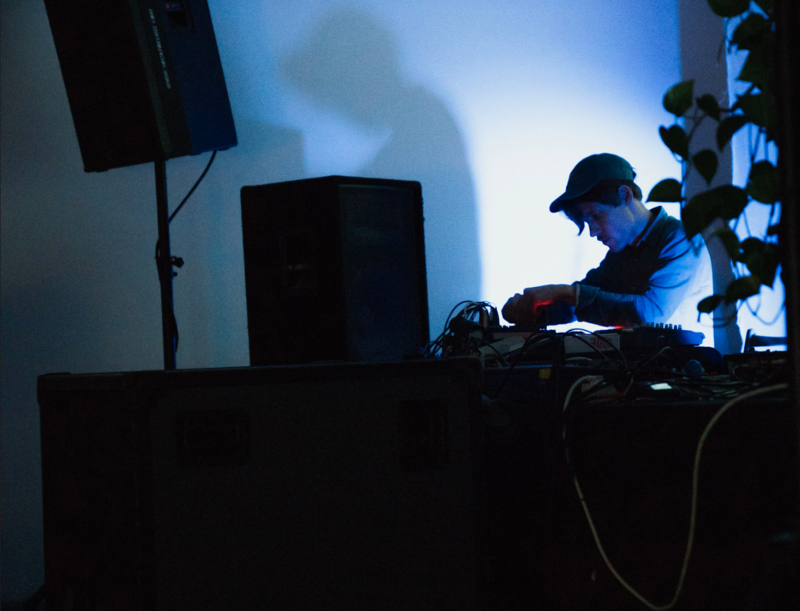 Haunting vocals and field recordings filled the room while a subtle beat hummed. People were into it, but they soon began to lay down for the evening. The space felt strangely comfortable for what little was there. The room had a stripped-down layout with eight or nine mattresses and some folding chairs. The room was covered in simple lighting muted enough that everyone could sleep without being disturbed. 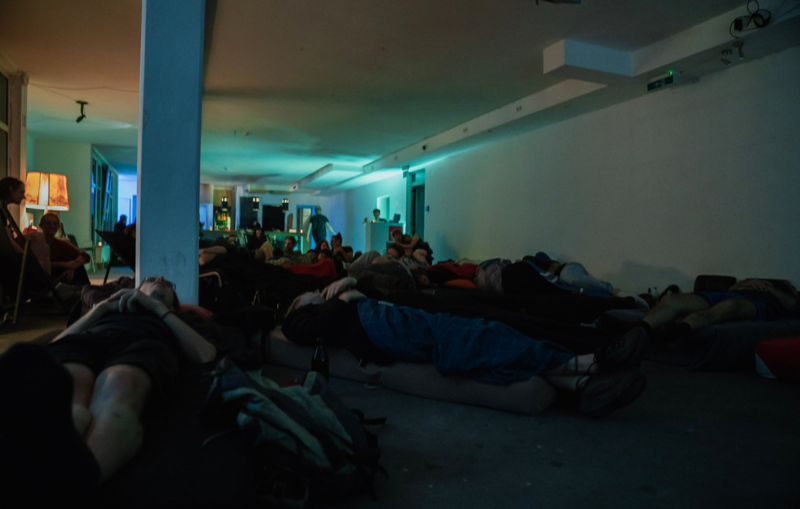 Within half-an-hour, the floor was filled with about 20 people on mattresses ready to shut their eyes and relax. The music started to mellow, and soon enough it was 2:30. Time for my set. I was a little nervous; I didn’t want to disrupt the slumber that had already dawned on some of the participants. It felt weird when I took over for Window Magic, the act that played before me. Nobody really noticed the change, because most everyone was sleeping, though there were a few who were calmly watching the night as it progressed. Between two and three in the morning felt like peak time, but for a reason entirely different than you might find at a normal club, because everyone was asleep. 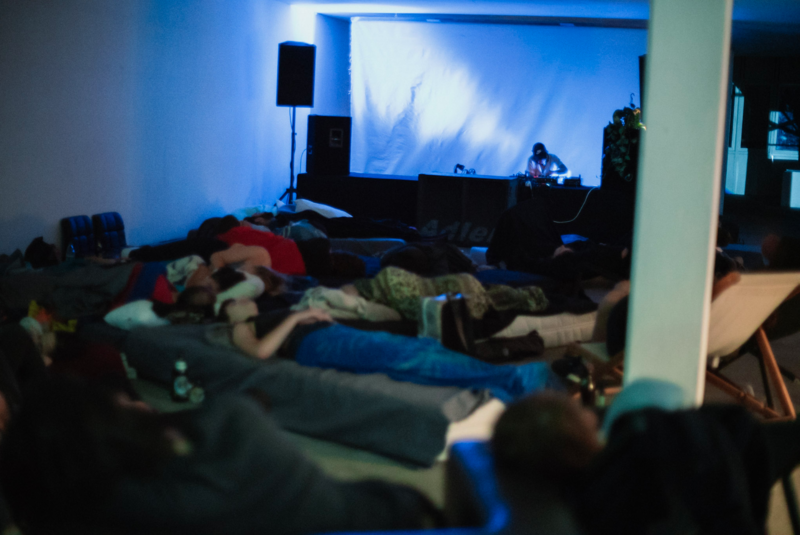 And playing to a sleeping crowd is a very unusual—and personal—experience. Without feedback from the sleeping crowd, I was free to pursue the development of the set on my own terms. Instead of hyping the crowd, my only guide was whether people stayed comatose or not. In a way, this was an unsung appreciation of the music that I was playing. I was creating a soundtrack for people’s dreams, and I wonder what it must have felt like on the other side. I had a simple setup compared to some of the other artists, but I maintained the same vibe throughout. I played “III” by the German artist Vomit Heat, “The New World” by the Russian artist Ashot Danielyan and closed with “Rhubarb” by Aphex Twin—among many other tracks. By the end of my performance everyone was completely asleep. Nobody had moved, and in that, I was able to deem my set a success. I would like to imagine people were applauding in their minds, but I have no idea if they were, because they were asleep. I played my last track, and then I let the next artist get behind the decks. A few minutes later, at the bar, where everyone was making cheese toasties, I exchanged a few words with some of the other artists. The man I met was from Tasmania, and he said that this event was like no other that he’d been to before. I agreed. I sat for a little to watch the audience drifting into dream world, but I knew that it would take a couple of these events to get used to feeling comfortable falling asleep in a room with strangers. Then I was in my own bed back at home, and as I was about to fall asleep, I thought about how different this night was from my others spent in clubs. And while it’s always nice to go wild and dance, this made me think about how these spaces can be used for very different experiences and purposes. In other words: There’s something to be said for sleep.